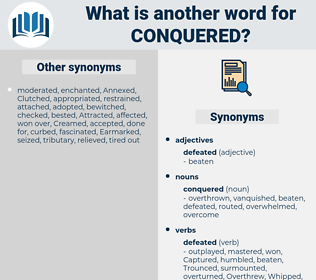 What is another word for conquered? acquired, seized, Captured, occupied, reopened, stole, Caught, earned, Grabbed, opened, opening, Straddled, Snorted, Gained, beat, Rode, Ran, packed, Picked, Hopped, Swiped, ate, pulled, Took, Got. 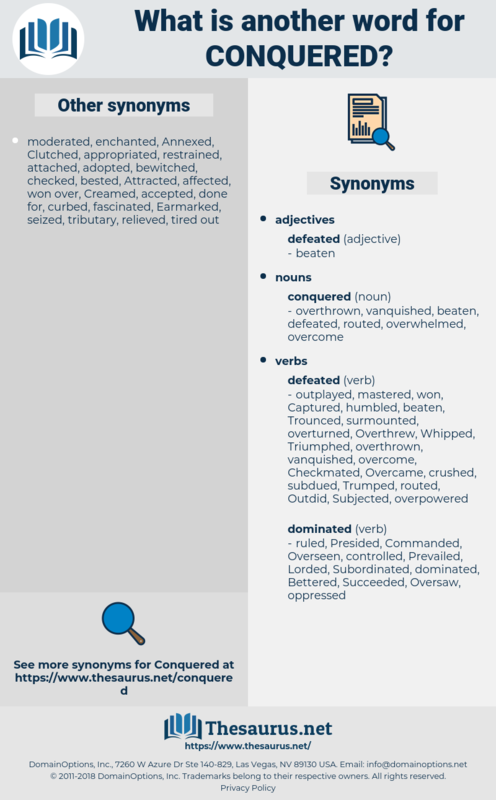 exterminated, overcome, subjugated, Eradicated, acquired, destroyed, annihilated, obliterated, subdued, Eliminated, Captured, crushed, resolved, conducted, restrained, controlled, mastered, Reined, devastated, ruined, accomplished, pulverized, shattered, earned, impressed, Decimated, undone, directed, harnessed, solved, Reached, Managed, realised, realized, Attracted, lost, reversed, checked, Achieved, Gained, Performed, beaten, stifled, Fought, broken, bested, sold, dashed, blighted, finished, taken, done, expired. We should be for ever dumb about them, if it were not that we know an evil covered up is not an evil conquered. Nevertheless, although beaten constantly, the Netherlanders were not conquered. chancre, chancery, censer, canker, Cenozoic Era, coinsure, commissar, censure, conqueror, commissary, Ciconia Nigra, common osier, Cheesemonger, concur, Commissure, cosmic ray, conjuror, conakry, conker, common shrew, conger, chinoiserie, cynosure, connoisseur, Cownose Ray, conjury, conjurer, censor, cane sugar, changer, common carrier, conjure, common measure, canine chorea, cancer, c major.